The Drayton Hall collections span centuries and generations of Drayton family members. This month we are highlighting an object that is related to the John Drayton (1715-1779) family through marriage. Pictured below is the front (left) and reverse (right) of a mourning pendant honoring Elizabeth Bull Drayton (c.1716-1751). Elizabeth was married to John’s older brother Thomas Drayton (c. 1708-1760). Thomas and Elizabeth were married at St. Andrews Parish on December 30th, 1730 and during the course of their 21 years of marriage had ten children, only three of whom appear to have survived to adulthood. One of their children, William Drayton (1733-1790) became a chief justice and corresponded with both George Washington and Thomas Jefferson. There is yet another interesting connection between the Drayton and Bull families in that Elizabeth Bull Drayton’s younger sister, Charlotta Bull (1719-1743) became John Drayton’s second wife; a connection most likely made through Thomas and Elizabeth. John and Charlotta were married on November 14, 1741 following the death of his first wife, Sarah Cattell Drayton, who was buried at St. Andrews Parish on December 24, 1740. This mourning pendant most likely belonged to Thomas and Elizabeth’s daughter Mary Drayton Fenwick (1734-1806), who was 17 at the time of her mother’s death. Mourning jewelry such as pendants and brooches were most often worn by women upon the death of a loved one. The front of this pendant is a black stone, possibly obsidian, painted with gold leaf the inscription: ELIZ:, DRAYTON, OB 6, NOV. 1751, AET:35, meaning Elizabeth Drayton, Died November 6, 1751 at the age of 35. According to the records of St. Andrews Parish, November 6, 1751 was the date of Elizabeth’s burial at the church. The reverse of the pendant contains a beveled piece of leaded glass covering a plait of finely woven blonde hair belonging to Elizabeth Bull Drayton. It is clear from the wear pattern of the loop at the top of the pendant that this object was well worn. Many thanks to Grahame Long, Chief Curator at the Charleston Museum, for his knowledge pertaining to mourning jewelry and assistance regarding this object. Drayton Hall Museum Collection, NT 85.1, Measures: 7/8”x1/2”. Gift of Mr. Peter Barratt. As work begins on the new visitor center, preparations to repurpose the historic caretaker’s house into an interpretive exhibit are underway. While the postbellum period and the 20th century are not periods of primary significance at Drayton Hall, these years were pivotal for the preservation of the property. Phosphate mining became the major industry in Charleston after the Civil War, relying on the labor of freedmen who remained in the area after Emancipation. Drayton Hall was first leased to a mining company in 1866, and tenant housing was subsequently built on the property to house the miners and their families. These families formed a community during Reconstruction, and many of them remained on the property through the first half of the 20th century, caring for the landscape and the main house while the Drayton family was gone. As we revisit our interpretation of the site with the construction of new facilities, our primary goal is to interpret a complete story of Drayton Hall, striving to illustrate the lives of the enslaved people, women, and African Americans. Unlike the colonial and antebellum periods where documentation of the enslaved workforce is scarce, evidence of the postbellum African American community is available through census records, oral histories, photographs, leases, maps, and architectural remains. We plan to use the caretaker’s house to interpret the postbellum period and the 20th century at Drayton Hall, allowing us to exhibit this documentary evidence for the first time to interpret the lives of the people who lived at Drayton Hall from the 1860s until the 1940s. Old Nancy Notes, Drayton Family Servant, undated. Courtesy of the South Caroliniana Library, University of South Carolina, Columbia, SC. One of the residents of Drayton Hall during this period was Nancy Notes (referred to as “Nanny” by Richmond Bowens). According to Bowens, she worked as a nurse for the Drayton children, Charles Henry II, Charlotta, and Bessie, in the early 20th century. It is possible that Nancy Notes was enslaved by the Draytons. The name “Nanny” appears on an inventory of slaves from c.1857. The name of Nancy Notes’ husband on the 1880 U.S. Census, Quash, is also listed on this inventory. While further research may verify if Nancy Notes and “Nanny” are the same person, her position as a nurse for the Drayton children suggests she had an existing relationship with the Drayton family prior to living on the property after Emancipation. Diana Roberts, Drayton Family Servant, undated. Courtesy of the South Carolina Caroliniana Library, University of South Carolina, Columbia, SC. Another woman we believe lived at Drayton Hall during this time was Diana Roberts. According to Richmond Bowens, she lived in one of the few identifiable houses along MacBeth Road today, referred to as the Roberts/McKeever House. It was a two-room framed house with an end chimney, brick piers and shingle roof. Diana does not show up on any census records from 1870-1940. However, a photograph labeled “Diana Roberts, Drayton Family Servants” exists in a collection of Drayton Hall photographs housed at the South Caroliniana Library. In the photograph, she stands at a wooden gate in front of a framed house, which matches the description Bowens gave of houses along MacBeth Road. The house behind her also matches the architectural remains of the Roberts/McKeever House on MacBeth Road today. The end chimney survives, as do the brick piers and other wooden framing elements. Further investigation will help us learn more about Nancy Notes, Diana Roberts, and the African American community that lived at Drayton Hall after the Civil War through the first half of the twentieth century. We are excited to share this ongoing research with visitors, as this period of time was pivotal for the preservation of Drayton Hall, and it is a story that has often been left untold, until now. Camero n Moon is a graduate of the College of Charleston with a degree in Historic Preservation and Community Planning and a minor in Anthropology. Her honors thesis chronicled the adaptive reuse of the Cigar Factory on East Bay Street and its relationship with the surrounding neighborhood. Before joining the DHPT staff in September 2014, she worked for Edgewood Builders, where she learned construction, preservation and restoration techniques at Medway Plantation and houses in the historic district. Cameron is currently working on ongoing Drayton Hall conservation projects as well as converting the museum shop, housed in the former caretaker’s house, into an interpretive museum space. Within studies of American architecture and material culture, Drayton Hall (c.1738) is regarded as an icon of colonial identity that reflects an intimate connection to popular European design, sophisticated craftsmanship, and the wealth of South Carolina’s plantation economy. Complementing Drayton Hall’s architecture is a remarkable collection of surviving furniture, ceramics, artwork and artifacts that exhibit distinctive patterns of 18th century consumption, taste and intellect. Drawing from surviving resources, this presentation will explore the 18th century formation of Drayton Hall and the values that led to its survival. This will be followed by a discussion of Drayton Hall’s future, including a vision to transform the site by improving the visitor experience and expanding our stewardship of the past. The two objects seen here are broken fragments of tobacco pipes. Made of kaolin clay, pipes were imported from England and were a common accessory during early America. They easily break and therefore are rarely recovered from archaeological sites in one piece. However, even with the smaller fragments, we can still learn a great deal. These two examples both exhibit maker’s marks, consisting of the maker’s initials, impressed onto the pipe bowl by the manufacturer. The bowls appear to be stamped and impressed with the initials “TD,” which was a common mark throughout the colonial period and into the 19th century. “TD” likely refers to either Thomas Dormer (1748-1770), who was a pipe maker in London by 1763, or the Bristol pipe maker Thomas Dennis (1734-1781). American-made pipes with the mark “TD” were later manufactured in the 19th century, however we used stem bore measurements, which correspond to production dates, to confirm that at least one of these pipes was made likely around 1720-1750. Corey Heyward, the Wexler Curatorial Fellow, first interned in Drayton Hall’s Preservation Department in the fall of 2011 during her sophomore year at the College of Charleston. After completing her junior year abroad at the University of Groningen in the Netherlands, Corey returned to Drayton Hall during her senior year to write her bachelor’s honor essay on the site’s delft tiles. Her in-depth research provided new information about their manufacturing dates and origins, the specific decorative patterns and their possible locations throughout Drayton Hall. Corey completed her M.A. in Anthropology, specializing in Archaeology and Museum Training, at George Washington University. From the beginning of her graduate work in 2014, she also interned in the archaeology laboratory at George Washington’s Mount Vernon where she was trained to use DAACS, assisted in archaeological fieldwork and learned to produce high quality archaeological photographs. The Wexler Curatorial Fellowship is a two-year, full-time fellowship position generously funded by Deborah and Peter Wexler. The Fellowship helps catalog the Drayton Hall archaeological collection using the Digital Archaeological Archive of Comparative Slavery (DAACS) under the direction of Archaeologist and Curator of Collections, Sarah Stroud Clarke. In 2013, an initiative began to evaluate and produce management plans for the preservation and conservation of some of the historic rice fields and ponds on Drayton Hall property. Historically, rice production was likely occurring here sometime around the end of the 17th century. The use of the fields and ponds for this function continued until the redevelopment of the property by John Drayton in the 1740s. Over the years, maintenance and use of the entire pond system had greatly diminished and the natural environment crept back in, attempting to reclaim a long-lost ecosystem. Unfortunately, this system (shown above) was unhealthy, lacking in good water quality and control, overgrown and breeched impoundments, and infested with invasive aquatic and wetland plants. Working with Folk Land Management, the Drayton Hall Preservation Trust evaluated and adopted a management plan for this historic system to re-establish the integrity and function of the impoundments; replace, add and increase the water flow capacity, pond depth and holding capacity; reduce and remove invasive plants; add habitat for colonial bird species while increasing the seasonal water surface and food sources for migrating waterfowl; and to better allow access and interpretive potential in the future (Phase II). Work on Phase I began in March of this year and finished in August; it was supported, in part, through funding from the US Fish & Wildlife Service, Ducks Unlimited, the Dominion Foundation and Gail and Parker Gilbert. The results of these partnerships speak for themselves in the images below. With the challenge of the recent Hurricane Matthew, the system was not only put to the test, but finally provided the necessary water, assisting to refill the ponds. The impoundments held, and although overwhelmed by this major event, the water control systems functioned much better than last year’s more impactful flooding. Drayton Hall welcomed Hurricane Matthew to the Lowcountry with secured windows, barricaded doors and a decade of preventative tree maintenance that resulted in relatively few damages to the property. Thanks to the ongoing stewardship efforts of staff and a focus on disaster preparation and management, only minor amounts of rain entered the historic main house, and less than 30 trees were toppled. Though record rains and a significant tidal surge resulted in the ponds overflowing and eroding portions of the entrance road (shown above), none of Drayton Hall’s historic live oaks or magnolias were impacted, and I strongly believe this stands as a testament to our recent efforts to proactively prune, fertilize and stabilize the site’s horticultural gems. Without the generosity of the Friends of Drayton Hall and their support of our historic trees, the storm could have resulted in the loss of significant landscape features. Still, hurricane cleanup is/and will continue to be part of the daily routine for Drayton Hall’s landscape staff and partners, including Bartlett Tree Experts, shown below as they help us to remove a downed tree. For now, the roads have been resurfaced, the site has returned to normal operation and we look forward to welcoming you onsite in the days ahead. Trish Smith’s latest work includes a 3D rendering of Drayton Hall’s Withdrawing Room with a c. 1740’s desk and bookcase from the Drayton Collection. Patricia “Trish” Lowe Smith is the Curator of Historic Architectural Resources at Drayton Hall. After graduating with a B.A. in Art History from the University of South Carolina Honors College, Smith received her M.S. from the Clemson University and College of Charleston joint graduate program in Historic Preservation. Smith came to Drayton Hall in 2010 as a Wood Family Fellow, and joined the staff permanently upon completion of her fellowship. In 2013, Smith was awarded a residential fellowship at the Colonial Williamsburg Foundation’s Digital History Center to study the application of 3D visualization technology for the documentation and interpretation of cultural heritage sites. During her tenure at Drayton Hall she has assembled the site’s first preservation archive, carried out several architectural conservation projects, launched a digital restoration of Drayton Hall, and is currently managing the rehabilitation of Drayton Hall’s iconic portico. 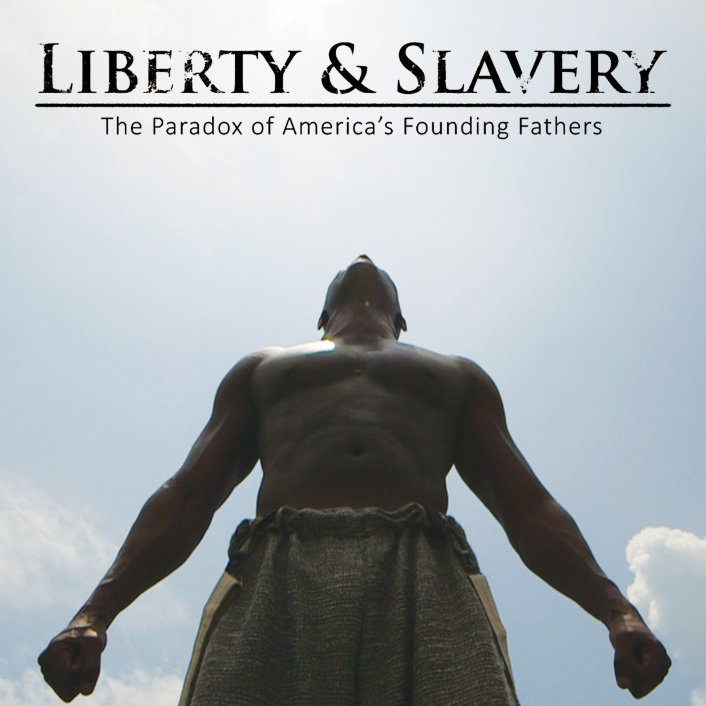 Drayton Hall is pleased to present the first Charleston-area screening of the award-winning documentary film “Liberty & Slavery: The Paradox of America’s Founding Fathers,” produced and directed by filmmaker A. Troy Thomas of Inertia Films. America’s Founding Fathers were men yearning for a nation of individual liberty and unprecedented independence. Thomas Jefferson expressed this desire in the Declaration of Independence in 1776: “We hold these truths to be self-evident, that all men are created equal…” But the origins of America were already seeded with a cruel paradox because many of the liberty-loving, southern Founding Fathers, including Jefferson and Washington, were also slave owners. Slavery was commonplace in the 18th century—not just in America, but in the world. But why did the non-slave-owning Founding Fathers compromise with the slave-owning Founders when it came to ratifying the U.S. Constitution? How do we make sense of this paradox? Watch as “Liberty & Slavery” searches for answers through a series of interviews with respected authors, historians, theologians, and many other notables. Free and open to the public. No advance reservations required. Doors open at 5:30 pm with a reception and introductions by Carter C. Hudgins, President & CEO of the Drayton Hall Preservation Trust, and filmmaker Troy Thomas. A Q&A session will follow the screening. Preservation Coordinator Cameron Moon removing one of the 74 louvered shutters from the main house. Hurricane season is officially upon us. Are you ready? Staff members across all departments have been planning, preparing, and taking necessary steps now in the event a storm should be headed our way. Case in point: the preservation department’s removal of louvered shutters in the main house. Trish Lowe Smith, curator of historic architectural resources, and Cameron Moon, preservation coordinator, with the assistance of volunteer Stan Younce (not pictured), have been getting their exercise as they removed the 74 louvered shutters from the windows in the house. Curator of Historic Architectural Resources Trish Smith after removing one of the louvered shutters from the main house. Volunteer Stan Younce assisted. Shutters will be stored in a protected area; they can always be reinstalled, but with the many practical advantages of the custom window covers, there are currently no plans to do so. Below is Trish’s diagram explaining how the plywood/Tyvek custom window covers work. The window glass is sacrificial in this system. If it breaks, rainwater will sheet down the Tyvek and back out instead of blowing into the house. *In response to questions about what kind of protective UV film we use: it’s Solar Gard SS50. We chose it because it’s removable, doesn’t drastically change the look of the glass, and cuts down a significant amount of UV light and heat. After four years, we’re very happy with it. About Drayton Hall – Founded in 1738, Drayton Hall is an icon of colonial America and the nation’s earliest example of fully executed Palladian architecture. After seven generations, the Revolutionary and Civil Wars, and numerous hurricanes and earthquakes, the main house remains in nearly original condition. A National Historic Landmark, Drayton Hall is a property of the National Trust for Historic Preservation and is administered by The Drayton Hall Preservation Trust. When the National Trust acquired Drayton Hall in 1974, it made the decision to “preserve” or stabilize the site. This action—unprecedented in its day—set Drayton Hall on a course unique among historic sites: it preserved its authentic, centuries-old timeline of history rather than restoring it to one specific period. Because it has never been modernized with electric lighting, plumbing, or central heating or air conditioning, the main house remains unfurnished, allowing the beauty of the architectural details to come through. Charles Drayton kept a detailed diary about all things Drayton Hall from 1784 to 1820. A few centuries later, we’re picking up where he left off. Welcome to the modern Drayton Hall Diaries. Wishing you a very happy Easter, from all of us at Drayton Hall Preservation Trust! And a furry hello from @hawkeye_the_corgi and Ginny, VIP landscape guests!